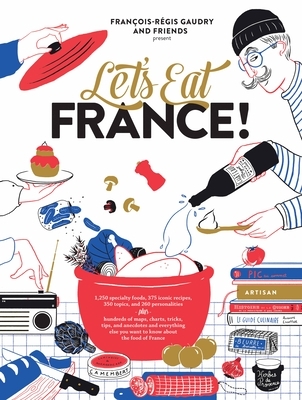 There’s never been a book about food like Let’s Eat France! A book that feels literally larger than life, it is a feast for food lovers and Francophiles, combining the completist virtues of an encyclopedia and the obsessive visual pleasures of infographics with an enthusiast’s unbridled joy. Here are classic recipes, including how to make a pot-au-feu, eight essential composed salads, pâté en croûte, blanquette de veau, choucroute, and the best ratatouille. Profiles of French food icons like Colette and Curnonsky, Brillat-Savarin and Bocuse, the Troigros dynasty and Victor Hugo. A region-by-region index of each area’s famed cheeses, charcuterie, and recipes. Poster-size guides to the breads of France, the wines of France, the oysters of France—even the frites of France. You’ll meet endive, the belle of the north; discover the croissant timeline; understand the art of tartare; find a chart of wine bottle sizes, from the tiny split to the Nebuchadnezzar (the equivalent of 20 standard bottles); and follow the family tree of French sauces. Adding to the overall delight of the book is the random arrangement of its content (a tutorial on mayonnaise is next to a list of places where Balzac ate), making each page a found treasure. It’s a book you’ll open anywhere—and never want to close. François-Régis Gaudry is a French food critic and host of the show On va deguster on the French public radio channel Inter France. He is also a food journalist at L’Express and the host of Très très bon on French television channel Paris Première. He lives in Paris. Find him on Instagram @frgaudry.